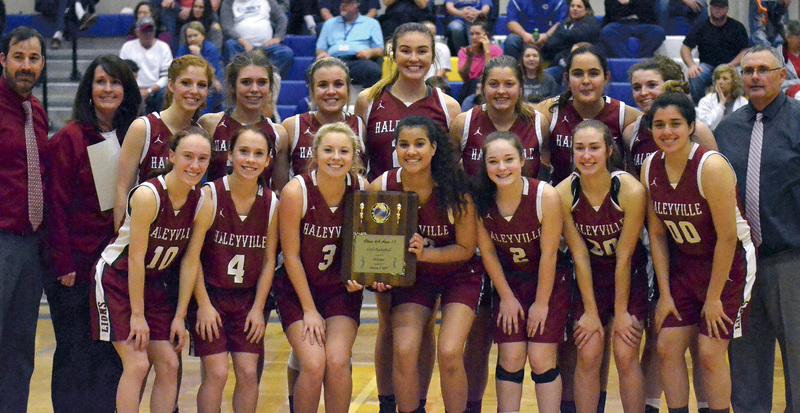 The Haleyville High School Lady Lions defeated Curry Thursday, Feb. 7, to win the 4A Area 11 championship at Curry High School. Team members are: Mae Boyles, Kaytee Boyles, McKenzee Reid, Madison Caine, Emma Nethery, Tesley Callahan, Ana Aaron. Back row: assistant coaches Andy Lambert and Kristi Ward, team members Ashton McCullar, Catie Aldridge, Reagan Kutis, Molly Gilbert, Kaitlyn Mobley, Marina Ortega, Alli Temple and head coach Senn Williams.